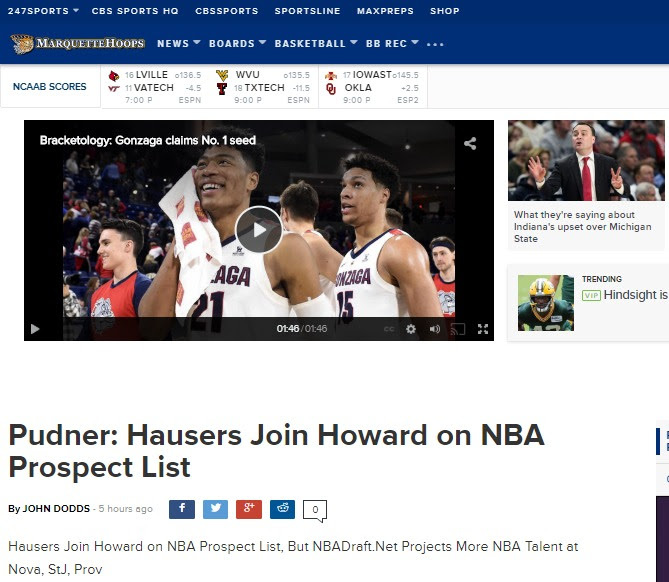 With March Madness looming as the next billion dollar sports event now that the Super Bowl is over, many sports fans just tuning into college basketball may be surprised that Gonzaga is not only a projected No. 1 seed but also features the second most NBA talent behind only Kentucky based on www.valueaddbasketball.com. Below we list any team that qualify as a Top 50 team based either on how valuable each player has been to date (Value Add ranking above replacement player) or how much talent they have based on NBA prospects rated from 100 (Zion Williamson of Duke) down to "1" in the notes section at Value Add Basketball and based on the guru of hoops talent at NBADraft.net. Click on this CBS247 story or the photo for the story, or on www.valueaddbasketball.com to sort all 4000+ players by team or conference. Another great night of basketball starts in a few minutes on ESPN with Louisville (ranked between 15th and 17th in the three major rankings) visiting a Virginia Tech team ranked a little higher (9th through 11th) but without its injured point guard Justin Robinson. The left column is the team's rank based on the potential of their players based on how well the main NBA ranking site since 2000, NBADraft.net, ranks them. The second figure is the value of all players' on the team above how well a replacement player would do (for example of Virginia's entire team were replaced by a standard borderline bench player, they would be 53 points per game worse than they are today for the best Value Add ranking even though they only have the 16th most potential NBA-level talent). On the flip side, Texas has the 4th most NBA-level talent though so far they have been only the 41st best team - though 8 years ago today Texas coach Shaka Smart was coaching the 88th ranked VCU team that went to the Final Four. For questions call 4046063163 or email back.